Having sold more than 300 million records worldwide, Madonna is noted as the best-selling female recording artist of all time by Guinness World Records. The Recording Industry Association of America (RIAA) listed her as the second highest-certified female artist in the U.S., with 64.5 million��album units. According to Billboard, Madonna is the most successful solo artist in its Hot 100 chart history. She is also the highest-grossing solo touring artist of all time, accumulating U.S. $1.4 billion from her concert tickets. Inducted into the Rock and Roll Hall of Fame in her first year of eligibility, Madonna topped VH1's countdown of 100 Greatest Women in Music. Additionally, Rolling Stone listed her among the 100 Greatest Artists of All Time and the 100 Greatest Songwriters of All Time. According to Tony Sclafani from MSNBC, "It's worth noting that before Madonna, most music mega-stars were guy rockers; after her, almost all would be female singers ... When the Beatles hit America, they changed the paradigm of performer from solo act to band. Madonna changed it back���with an emphasis on the female." Howard Kramer, curatorial director of the Rock and Roll Hall of Fame, asserted that "Madonna and the career she carved out for herself made possible virtually every other female pop singer to follow ... She certainly raised the standards of all of them ... She redefined what the parameters were for female performers." According to Fouz-Hernández, subsequent female singers such as Britney Spears, Christina Aguilera, Kylie Minogue, the Spice Girls, Destiny's Child, Jennifer Lopez, and Pink were like her "daughters in the very direct sense that they grew up listening to and admiring Madonna, and decided they wanted to be like her." 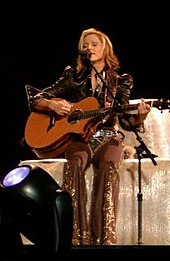 Madonna has also influenced male artists, inspiring rock frontmen Liam Gallagher of Oasis and Chester Bennington of Linkin Park to become musicians. ^ Lieberman, Rhonda (May 9, 2003). "Weighty Madonna: Rhonda Lieberman on 'X-STaTIC PRo=CeSS'". Artforum International. BNET. Retrieved January 5, 2017. (Subscription required (help)). ^ Christopher, James (February 14, 2008). "Review: Madonna's Filth and Wisdom". The Times. London. Archived from the original on May 10, 2008. Retrieved December 31, 2016. (Subscription required (help)). ^ Schmidt, Veronica (April 21, 2008). "Madonna Goes to No. 1 For the 13th Time". The Times. London. Archived from the original on July 19, 2008. Retrieved December 31, 2016. (Subscription required (help)). ^ Banda, Mabvuto; Georgy, Michael (May 25, 2009). Ireland, Louise, ed. "Madonna Loses Adoption Bid in Malawi". Billboard. Reuters. Retrieved January 1, 2017. ^ Serjeant, Jill (August 20, 2010). Tourtellotte, Bob, ed. "Madonna sued over 'Material Girl' clothing line". Reuters. Retrieved January 1, 2017. ^ Pre-Madonna (CD, VHS). Madonna. Soultone. 1997. 83332-2. ^ a b Worrell, Denise (May 27, 1985). "Madonna, Why She's Hot". Time. Retrieved August 25, 2014. (Subscription required (help)).